which is what I asked for. Thanks, Santa! I have finally convinced Dave that lumber, field fence, and fence posts are suitable as Christmas presents. 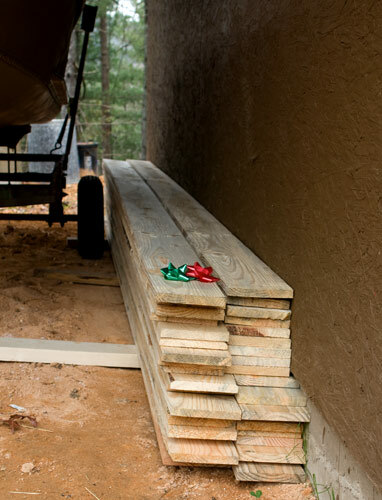 I used to get “a roll of fencing/a load of 1 x 4’s isn’t a Christmas present”. Yes it is. I used to raise and show Rex rabbits. I had over 100 rabbits and a 20′ x 30′ barn of hanging cages. By the time we moved here, I’d gotten out of the Rexes and had 7 Angoras. Dave built me a nice 10′ x 12′ barn for them. They got old or sold and now I have just two Angora rabbits (although it was kinda cold a few weeks ago, so I thought the buck and doe would be warmer in the same cage). Dave built me some really nice hutches that I can move around – with a tractor. I swear the guy doesn’t know the meaning of “I want something I can move around.” as in without having to go get the tractor or three neighbors. The 10′ x 12′ barn is slowly turning into my wool sorting and storage room. We put a floor in it last month and now are working on siding – my bundle of sticks. The rabbits were in there for years without getting wet, so I was thinking no problem with the wool. I somehow forgot that when the rabbits were in there, we were in the drought and it seldom rained. It’s sure raining now – we are at 87 inches for the year measured at the reporting station a few miles from us. I’ve sure had to quit boasting about not having any drainage problems in the sheep barn now that we actually have some moisture that needs draining. 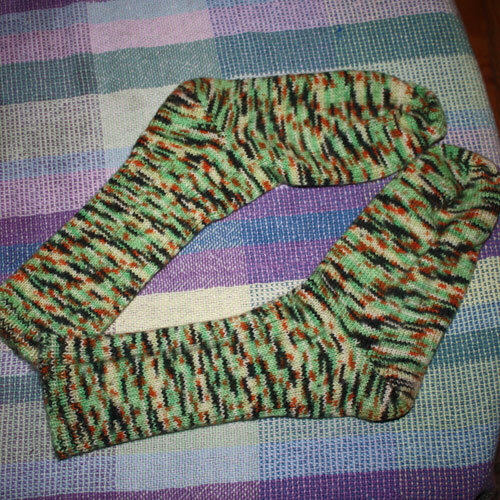 I made Dave a pair of socks for Christmas with my circular sock machine. Since Dave felt that a bundle of sticks was really not “personal”, he added ..
this amazing pair of jammy pants. I’m still rolling on the floor laughing – he said “I don’t what that pattern is”. It’s Mickey Mouse! 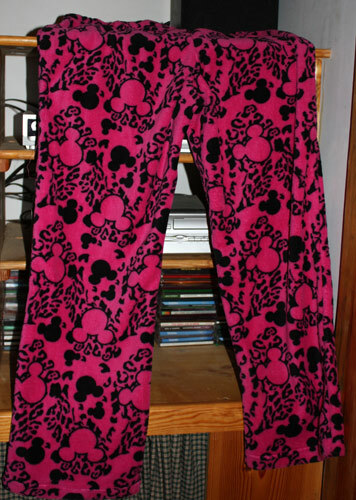 I love Mickey Mouse, but am just a tiny bit glad that they aren’t my size and that Dave saved the receipt. 5 Responses to I tried to be nice.. I LOVE practical gifts – wheel barrows, buckets, muck boots – some of my favorite gifts! The socks look great and I agree about the bloom of real wool. BTW: what is the contraption next to your pile of stix? It looks like a buggy or something horse drawn. Like you, I love practical/useful stuff. This year I was surprised by my husband and son with an antique butter mold and the old family churn that my husband refurbished. WOW!! Also like you, everything Ken makes requires a tractor to move. I asked him to build me a sled I could use to move my electronet fencing with. I imagined something light weight that I could pull. BUT noooooo! I got a heavy duty sled pulled by the tractor!! Sheesh! Good intentions, I guess. I would love to get sticks also. I got a microscope for Christmas so I can do my own fecals now. My husband thought I was nuts and maybe I am but I got what I asked for from Santa. Hope you had a Merry Christmas.